1) There’s a sizeable market for books about Edgar Allan Poe. Every year, half a dozen Poe-related books are released, not even counting re-re-re-re-re-issues of his works. 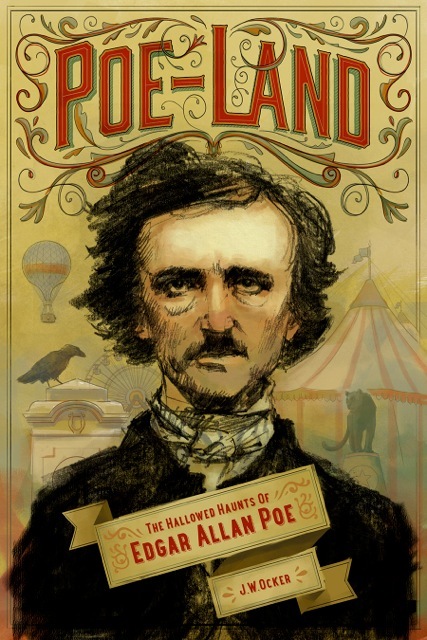 Heck, about a month before Poe-Land streeted, yet another biography of him was released. 2) Poe is more present in the popular conscious than ever. I wrote the pitch in 2013. Just in that year, the Baltimore Ravens won the Super Bowl. FOX debuted The Following. Lynn Cullen’s book Mrs. Poe was everywhere. An original manuscript handwritten and signed by Poe for his poem “The Conqueror Worm” pulled in $300,000 at auction, and it was reported on extensively by the media. And Boston was plotting a statue of him. 3) This book would be unique. Of the hundreds of books about Poe, I hadn’t seen anything close to the Poe-Land concept. I was actually surprised that nobody had yet done it. And terrified that I’d stumble on an obscure work somewhere that nullified this extremely important selling point. And then I did. Fortunately, I’d already sold the book to the publisher. It happened while I was writing the chapter on Rhode Island. For that section, I was using the life and fame of H.P. Lovecraft as a context for the life of Poe. The two authors have a lot in common in both life and legacy, and I used the city of Providence as a crossroads for their lives because, well, it’s literally such. 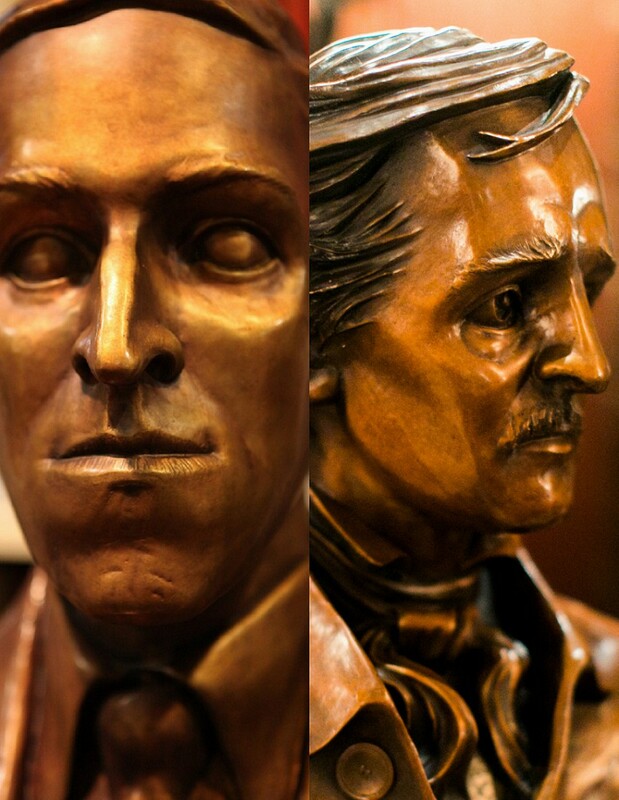 Plus, I wanted the unveiling of the Providence Athenaeum’s Lovecraft bust to be a lens for looking at how Poe’s own posthumous fame had burgeoned. While researching Lovecraft, I needed to access his pamphlet of an autobiography, Some Notes on a Nonentity. So I went to my shelf and pulled down a little-thumbed-through volume of his nonfiction underwhelmingly called Miscellaneous Writings that was edited by, of course, S.T. Joshi. 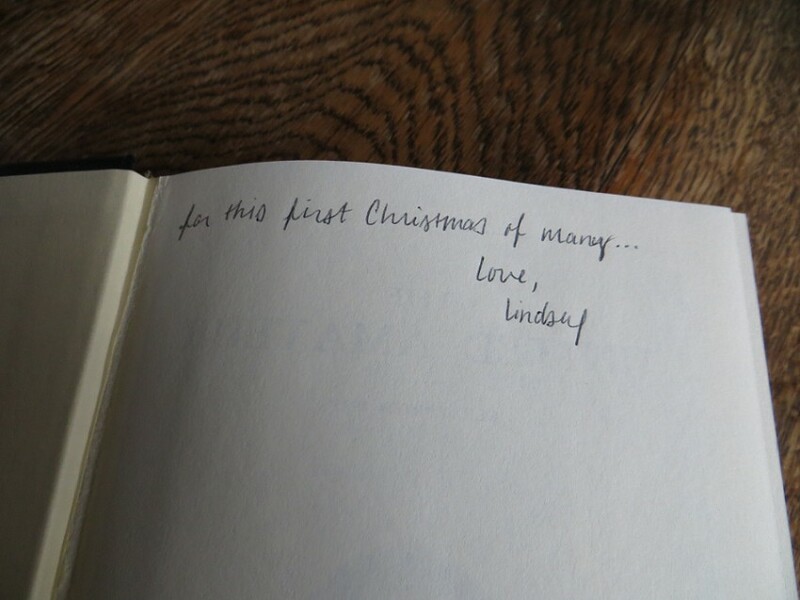 My wife had given it to me on our first Christmas together. As I scanned the table of contents in this 600-page book, I caught the subhead “Antiquarian Travels.” And there, below pieces on Vermont and Charleston and the New England region in general was a 1934 essay entitled “Homes and Shrines of Poe.” By this time in the process of the book my eyes were hyperattuned to those latter three letters. I flipped to it at the speed of ripped pages. As I inhaled the short essay, I realized what I was reading. It was Poe-Land, accomplished in 2,000 words. I’d inadvertently ripped off none other than H.P. Lovecraft. Seriously, though, it’s an extremely informative essay. Lovecraft gives exact locations (not always accurate) in more or less chronological order for everywhere Poe lived, no matter how obscure. Even better, he makes sure to mention whether the sites are marked. I’ve been poked fun at (and rightfully so) for how obsessed I am with plaques in Poe-Land, and in the essay Lovecraft is obsessed with the absence of them. “Tablets,” he calls them and puts down anytime a Poe site doesn’t have one. The disappointment is evident each time. 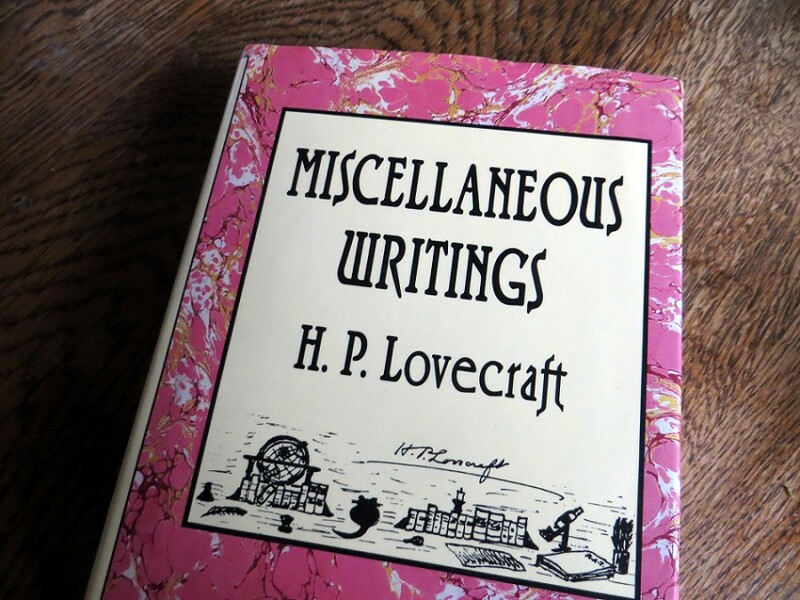 The only problem with the essay is that it’s difficult to see which of these place Lovecraft actually visited and which he’s hearing about secondhand. He does make a few errors and notable omissions. For instance, he points out that no plaque marks the site where Poe wrote “The Raven.” In fact, one was installed by the New York Shakespeare Society about a decade before Lovecraft wrote the essay, and just two years before Lovecraft moved to New York himself. Of course, these days there are two plaques marking the spot. Lovecraft also says that West Point has not commemorated Poe’s brief education there, when in fact the Poe Arch would’ve been around for decades at the point of his writing. I assume this page is jacked up from when I dropped it in surprise. But it’s what has and hasn’t changed in Poe-Land since the early 20th century that makes the essay really interesting. And, of course, this became more interesting to me as I was in the process of visiting most of those places. But a lot has stayed mostly the same. 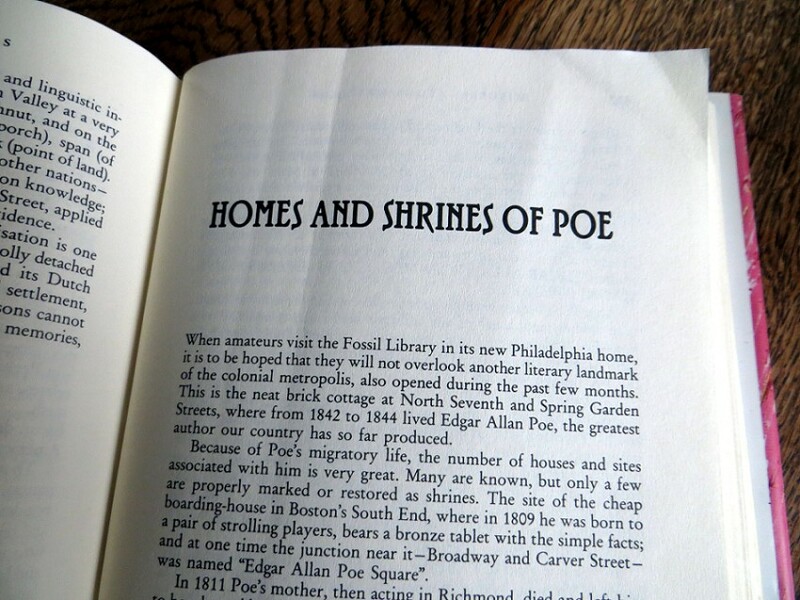 Like the Richmond Poe Museum (or Poe Shrine, as it was called back then), even to the point where Lovecraft describes its holdings as “one of the best Poe collections in existence.” Same with the preserved dorm room at the University of Virginia, complete with bronze plaque above the door. Most interesting was his short account of the “famous” Fordham Poe Cottage, were Lovecraft calls out the three items of furniture—a mirror, a bed, and a rocking chair—that were in the house during Poe’s life there, the same three pointed out to me by Mr. Neil Rally on my own visit. Lovecraft’s essay, overall at least (style-wise I’d have loved more of Lovecraft in it), is exactly what I wanted Poe-Land to be, a time capsule. If all of Poe-Land Atlantises into the ocean or if we find out tomorrow that Edgar Allan Poe was really a pen name of Washington Irving, I hope the value of my journey in Poe-Land as a document of a moment and place in time remains. Learning what was considered important or inconsequential regarding his legacy. Understanding what wasn’t then known. Marveling at what has remained unchanged. Getting confused by the pop culture references.